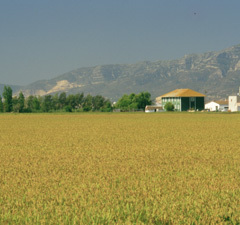 Rice (Oryza sativa) is the base of the Ebro Delta agriculture. Out of the 32,000 ha the delta plain has at present, nearly 20,000 ha of rice are being cultivated with an average production of 6500 kg/ha. Different varieties are grown which are grouped according to the features of the grain. The prevailing varieties are the ones having a short pearled grain, which is the type that is mainly eaten in Spain. Nowadays, there is not a major variety, as it happened years ago with Bahía. However, Bahía and Senia are still the most widely cultivated ones. On the other hand, the Ebro Delta is one of the most important humid areas in the Mediterranean with 7,736 ha declared as a Natural Park between 1983 and 1986. In addition, at the moment, as regards preservation of the ecosystems that make up the Delta, rice fields play an important role and therefore, it is very important to try not to let the surface of this cultivation be reduced and at the same time to try and diminish the negative effects as much as possible. Because of the above, PROBODELT, intends to contribute to making rice cultivation perfectly compatible with preservation of the Delta ecosystems by developing and applying sensible fighting strategies against the main pests. So far, the greatest efforts have been aimed at monitoring and controlling the Rice stem borer (Chilo suppressalis) and monitoring the populations of Whitespotted stink bug (Eysarcoris inconspicuus). In line with this, Probodelt has started to apply the same criteria used in the Pals rice area for the strategy of monitoring and controlling pests in the Delta.